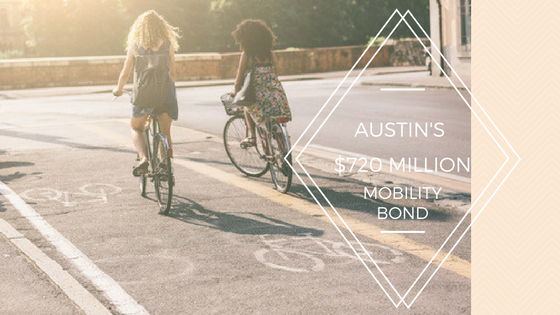 The Austin City Council voted to move to the next step and put a $720 Mobility Bond before voters, Building ATX reports. They have until August 22nd to put it on the November 8th ballot. The proposal includes $101 million for Regional Mobility projects, $482 million for Corridor Improvement projects, and $137 million for Local Mobility projects. The project wants to cover everything from regional roads to mass transit. The corridor improvement projects would cover recommended improvements for seven corridors: Burnet Road, Airport Boulevard, Martin Luther King Jr., Guadalupe Street, East Riverside and North and South Lamar. As reported by the Austin Business Journal, Airport Boulevard is expected to see $74.4 million to upgrade intersections and make stormwater and drainage improvements in the short term and in the long term, make the road able to handle cars, bikes (with protected bike lanes), and pedestrians (with new sidewalks). There also may be the potential to use medians to allow buses to travel faster through the corridor. FM 969/East MLK Jr. Boulevard from 183 to Webberville is the longest and one of the least-developed corridors in the plan. It will see additional lanes, protected bike lanes, and pedestrian improvements to the tune of $111.2 million. East Riverside Drive currently has $361 million earmarked for the corridor, but $253 million of that was for urban rail, which lost at the ballot box. The plan could be changed to run buses rather than trains down the center of Riverside Drive or the money could be eliminated from the budget. No matter the fate of the median, pedestrian and bicycle-friendly improvements will be made. North Lamar Boulevard and Burnet Road near Allandale will have their $153 million piece of the pie shared approximately evenly. Burnet Road will see pullouts for buses and transit-only lanes in certain spots. North Lamar will have new bus shelters, bicycle lanes, sidewalks and road reconstruction. South Lamar’s $60 million will go towards street upgrades, sidewalks, and protected bike lanes. In addition, the Smart Corridors will see remotely-timed smart traffic lights, turn lanes and medians to prevent waiting behind someone making a left turn, and cue jumps so buses can get ahead of traffic. The local mobility money would be for non-vehicle related projects including master plans for sidewalks, urban trails, bicycles, and the Vision Zero plan. Mayor Steve Adler also sees the improvements on the above corridors as benefiting transit, bicycles and pedestrians with dedicated bus pullouts, protected bike lanes, and sidewalks. 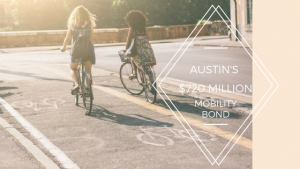 In an editorial on Medium, Mayor Adler outlined his position on the mobility bond and explained that many of the proposed expenditures are simply putting into motion the recommendations of past studies. Many of the roads on the corridors that are slated for improvements were built before Austin’s enormous growth and simply weren’t designed to have residents, buses, bikes and pedestrians all vying for space when they were first built as county highways. The bonds would increase taxes by less than $5 per month, or $.16 per day, Mayor Adler tells KVUE. Many rail advocates are disappointed to see it not included in the proposal, but Mayor Adler says his goal was to get these funds approved quickly. He is still a strong proponent of rail, but wants to see it handled separately from the Mobility Bond. Living in an apartment near transit makes life much more convenient, even if you have a car. An experienced apartment locator can help you find an apartment near public transportation and mobility amenities like bike lanes and sidewalks. Give Austin Apartments Now a call today at 512-318-2702 to find your dream abode!